It was a very wet, white foggy day, all the trees dripping on the treehouse roof. We had to be up at six to meet with a traveling visitor. It was probably C’s first time up before daylight in years. “This is such a thrill!” I warbled. “Now you know what it’s like when I go swimming“. He was a bit less jazzed to be shuffling through a dim, unheated hovel. But it was different: the front room was at a record tidiness level. Which means my Scary Room was piled higher than usual with bags of unsorted Desk Papers, Couch Junk, library books, and (gasp) food that wouldn’t fit in the fridge. Visitor Chris was a welcome face. We’ve been pretty chary of the bike industry for a few years, and to reconnect with a straight-talking, intelligent person who is one of the maybe ten people that Charlie took out on a ride (Muir Woods, 1984) before going Full Hermit. Then another knock: Frances M., who just joined the club. Bug was at the parking lot–young mom with kid still on the breast–unfurling her carrot cake for us. Heather and her friend came a skoash later and we were off. Lots of walkers, dogs, and other cyclists on the trail. 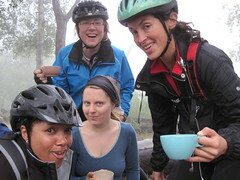 We stopped for tea at Madrone Dome. See if you can identify the Wombats gang sign. Some guys rode by, and told us it was sunny up at the top of Tam. A quick change of plans: Some of us would go out for half the day, and the others would Stick To Plan and ride the Lagunitas picnic loop. 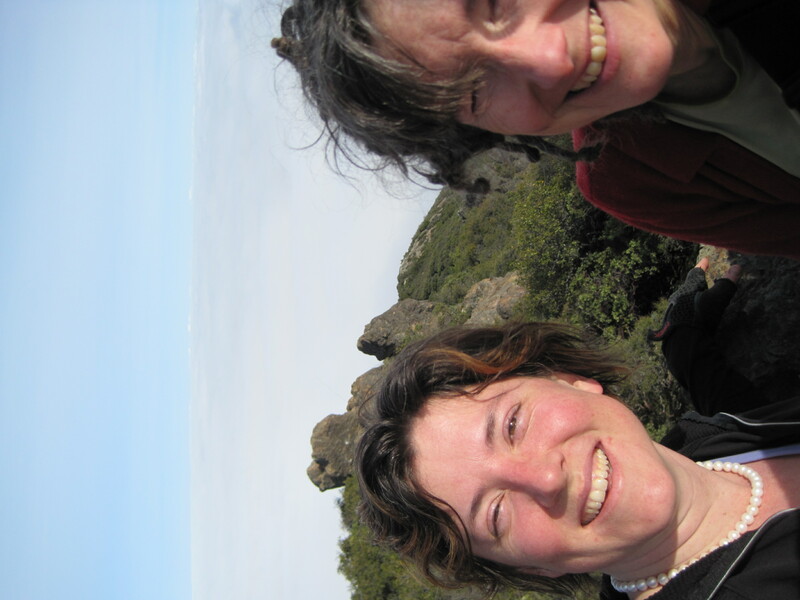 Fran and I got to the top, sun too bright to look at, above the vast fog blanketing the world. Mt. Diablo, & St. Helena were visible (plus a snowy Sierra range on remote eastern horizon). ~ by jacquiephelan on January 3, 2010. This seems wonderful. I want to make one of these rides. The pictures are pretty crisp and clear too!